Early in the month we took some time out from DIY to visit friends in Dorset - Bryn enjoyed his first visit to an English beach even though he wasn’t quite sure what he’d find there! On our return home, eleven of our 150-year-old sash windows got a full professional refurbishment - repaired wood work, new cords, smart brass catches and draught-reducing brushes. Then it was over to Stu to repaint them all inside and out, improving his balance as he did so….. It was lovely to re-open the house to guests after her winter break; the wild garlic was sprouting in the garden just in time to make it into our breakfast frittatas! The middle of the month brought Storm Gareth which, combined with run-off from the mountains and high tides, caused the river Conwy and her tributaries to burst her banks. This picture is of the ‘stream’ at the end of our garden which is usually 5 feet below the wall on the right hand side….Fortunately these occasions are rare! The flood defences held and the village was pretty much unscathed once the water had receded. ‘Guest research’ continued during March - it was only right we try the great range of local beers available at the Albion Ale House in Conwy. A warm (and dog friendly) welcome awaits you! As the weather turned milder Bryn got his first castle experience - here he is surveying the fantastic views from Criccieth castle, which we followed with lunch at the always-excellent Big Rock cafe in Porthmadog. We’re looking forward now to a busy season - meeting new guests and catching up with returning friends! After a busy but rewarding season with lots of fantastic guests, we enjoyed a well deserved holiday in America. We started off with a family wedding near Boston, then took a road trip south through 11 states, ending with a few days’ fun at DisneyWorld! In December we met our new best friend for the first time - our golden retriever Bryn. Here he is when we chose him, the day we brought him home from mid Wales, and several weeks later thoroughly enjoying his first trip to the beach. He is already such a huge and fun part of our lives - we really can’t imagine life without him! And he’s looking forward to meeting lots of people in 2019! We’ve been busy inside the house, making improvements here and there and adding further character, all ready to welcome our guests in the spring. Replacing 17 pairs of door handles first kept Stu occupied (if somewhat frustrated!) 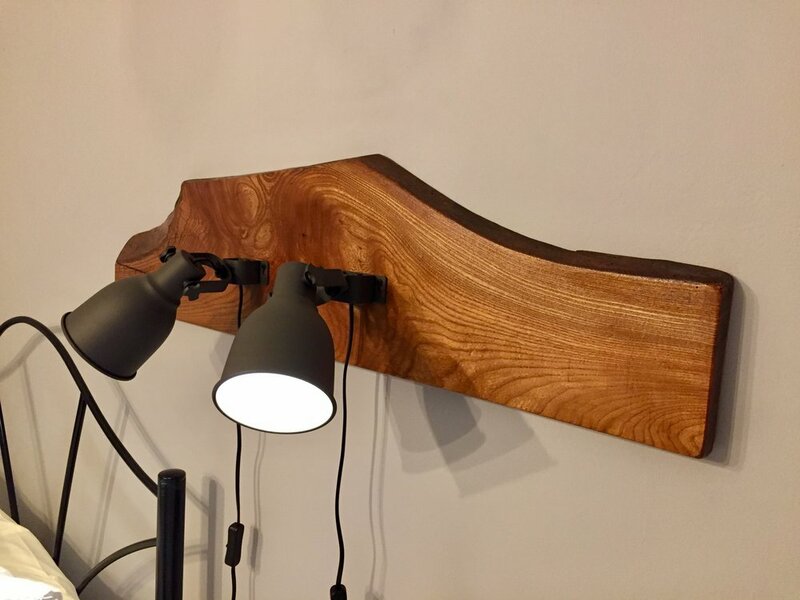 for a good couple of days, but this was more than offset next by the pleasure of mounting new bedside lights to a beautiful piece of local elm to add a twist to Room 1. Big thanks to our woodcrafts/artisan baker friend Jay Butters! All of our bedroom furniture was given a bit of TLC with soothing greys replacing the pine finish - it brightens the rooms tremendously. Rhos-on-Sea carpets did a brilliant job fitting new carpets in Rooms 4 and 5 and modern flooring in all our guest bathrooms. Rooms 2 and 3 got new shower cubicles too - it’s all really given the rooms a new lease of life! Finally, we had great fun sourcing a pair of mid 20thC Indian cinema chairs for our upstairs guest lounge from Reclaimed Word in Cheshire. It won’t be long before we’re back there for another rummage amongst their treasures. As the year turned and spring hove into view, we were delighted to receive our booking.com award for 2018. Thank you to all our guests who supported us last year (great to already know that lots will be returning) and we look forward to welcoming both you and others in 2019! We started the month with a few days in the Peak District during a brief break between guests. It was lovely to retread our favourite walks around Hathersage, including the stunning Stanage Edge. 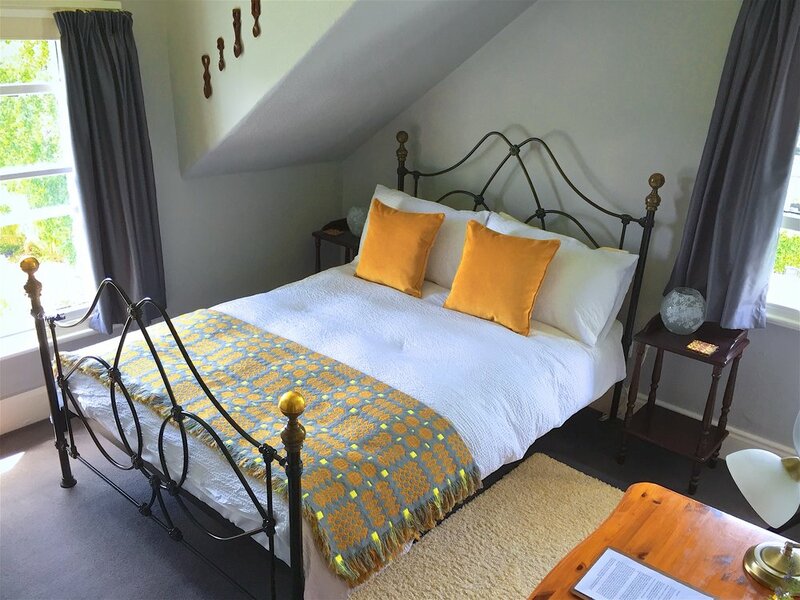 Cosy Highbury Cottage was our base - highly recommended! Back home, Trefriw was again on the route of the Wales Rally GB - the cars roaring past provided an unusual (and loud!) spectacle for our breakfasting guests, most of whom were here to enjoy the stages anyway in the surrounding area! 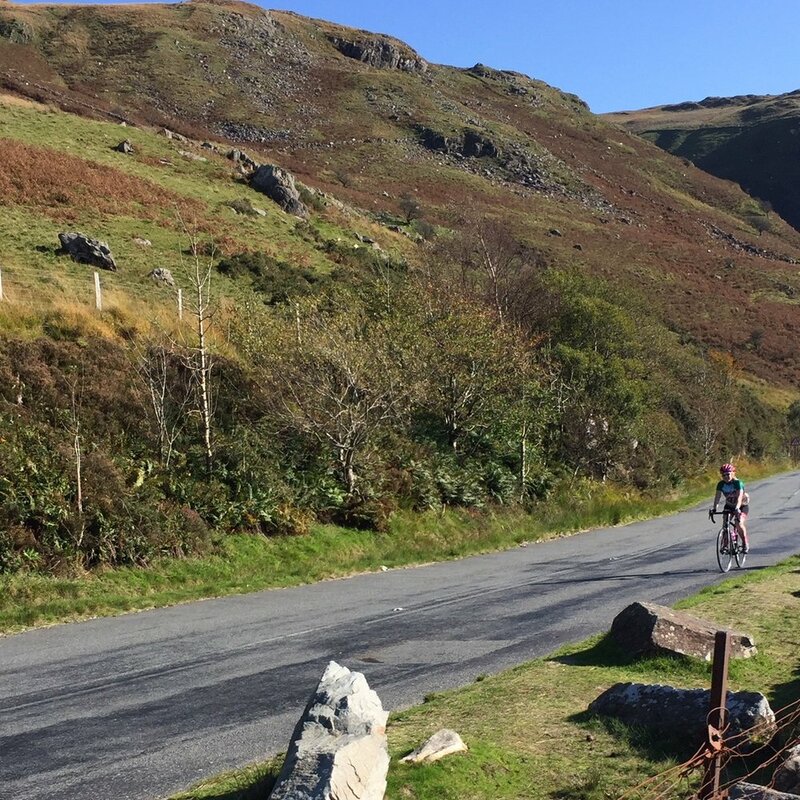 A spell of sunny weather meant only one thing - time to face my fears and ride up Bryn Gwynant for the first time - one of the famous cycling hills in the area!! The flat-to-downhill route out warmed the legs up nicely, and lunch at the always excellent Caffi Gwynant provided the necessary fuel for the upward return….And I actually really enjoyed it! A steady grind in low gear, and a lack of sharp inclines, means you can appreciate the scenery better on the way up (honest!). Fears vanquished! Inside the house, we welcomed the cooler months by installing an electric stove and cosy rug in our upstairs guest sitting room. We’ve also added unique feature lighting in all of our guest bedrooms, designed and created by Stu using products from Creative Cables. As the month closed and we prepared for the end of the season we had an excellent afternoon at the Conwy Feast food, music and arts festival, enjoying the local food and drink stalls for a late lunch! 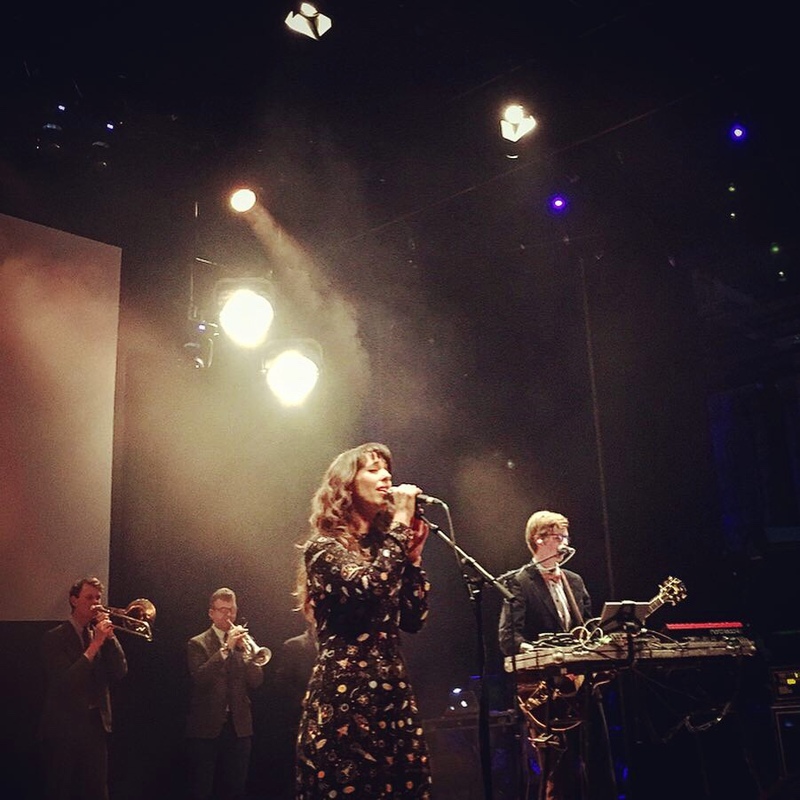 We were also lucky enough to get tickets to see the sublime Public Service Broadcasting play at Pontio Arts Centre, Bangor. A fantastic evening of music, by turns uplifting, moving and inspiring - do check them out! As the season turned we continued to be busy welcoming people from all over the world and our guests continued to enjoy some fine and dry weather! We still found time to enjoy various activities in our wonderful area, kicking off the month at Surf Snowdonia’s drive-in cinema with the back-to-school classic Grease. Funny how the words to all the songs come right back into your mind….! And we were back there later in the month for the annual Pro Surf Challenge…. Mid month we visited the annual Conwy Honey Fair where we were delighted to find honey made in Trefriw! The Fair dates back more than 700 years to the reign of King Edward I, when local beekeepers were first given the right to sell honey within the walls of Conwy every 13th September without charge. Whilst in Conwy we also picked up this old printing block tray from Drew Pritchard Antiques. We just love the old scraps of paper still clinging on to the wood. It is now on display in our guest snug! In the interests of guest research (…!) we thought we really had to pay a visit to our local gin and whisky distillery - Aber Falls at Abergwyngregyn. We enjoyed an interesting tour followed by tastings of their delicious gins and liqueurs - several of which are served in the Old Ship pub right next door to us! The whisky is under wraps for a few years yet but we’re sure it will be worth waiting for! Also watch this space for their new visitor centre in 2019. We took advantage of the fair weather to get out on our bikes - spectacular scenery and early autumn colour above the Conwy Valley. I also braved a chilly swim in one of our local lakes…. Finally, we ended the month helping to run our village coffee morning in aid of Macmillan Cancer Support. We had a fantastic turnout and raised a brilliant £610 - a huge thank you to everyone who baked goodies, donated raffle prizes and bought cakes!! August was predictably our busiest month at Crafnant House with a huge array of guests visiting our beautiful corner of Wales from places as far apart as Austria, Malta and Australia. They enjoyed between them plenty of zip wiring, inland surfing, hiking, and even an Ironman competition! In the garden we harvested our delicious potatoes and raspberries, which found their way into our guest breakfasts - the latter make a lovely morning cake! We continued to enjoy the summer weather and exploring our local area by bike. 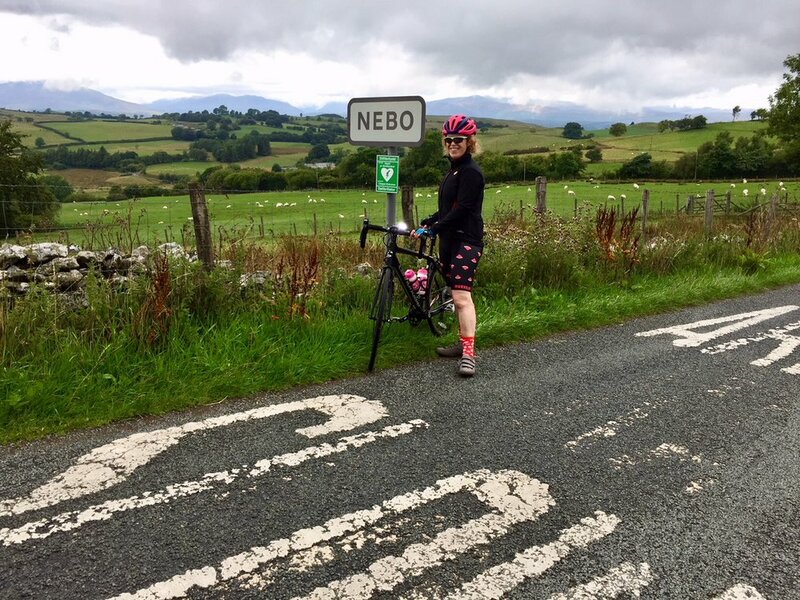 I rode the long climb to nearby Nebo for the first time - the view at the top across Snowdonia was well worth the pain in my legs and lungs!! Stu and I also did the Tour de Mon (Tour of Anglesey) which offered stunning scenery all the way round. It’s certainly worth bringing your bikes if you come and see us! In the interests of ‘guest research’, we enjoyed a very tasty lunch at beautiful Caffi Gywnant - a former chapel close to the start of the Watkin Path up Snowdon. Chorizo and baked eggs for Stu; Manx kippers for me. Yum - well worth a visit!! As the month closed we took delivery of our smart new Crafnant House postcards, created using an old sketch of the house, and inspired by our friends at Warren House B&B. 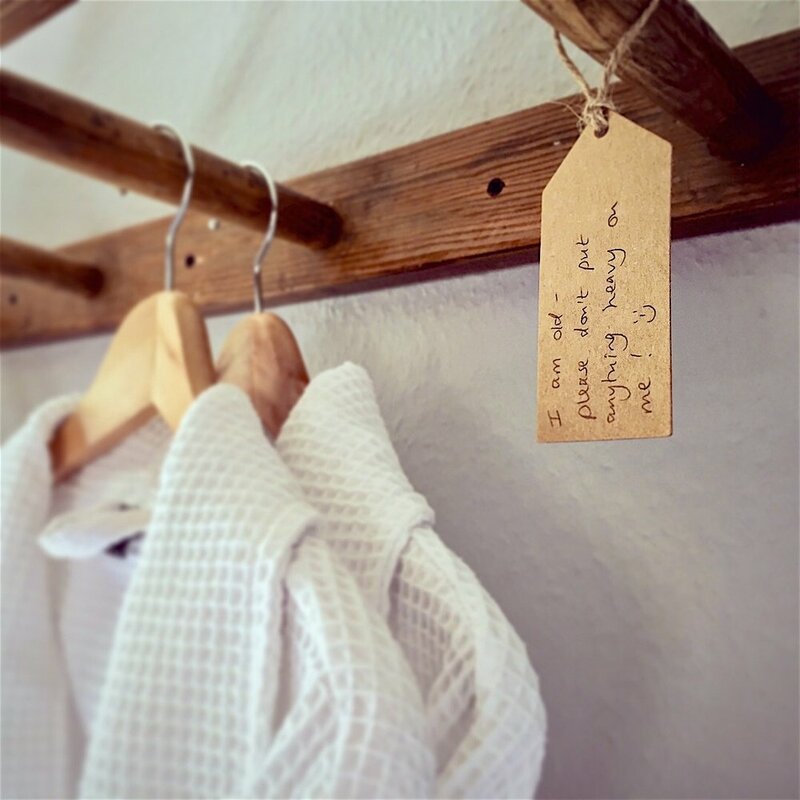 Now our guests can let their friends know how much they enjoyed their stay in the old fashioned way :-). 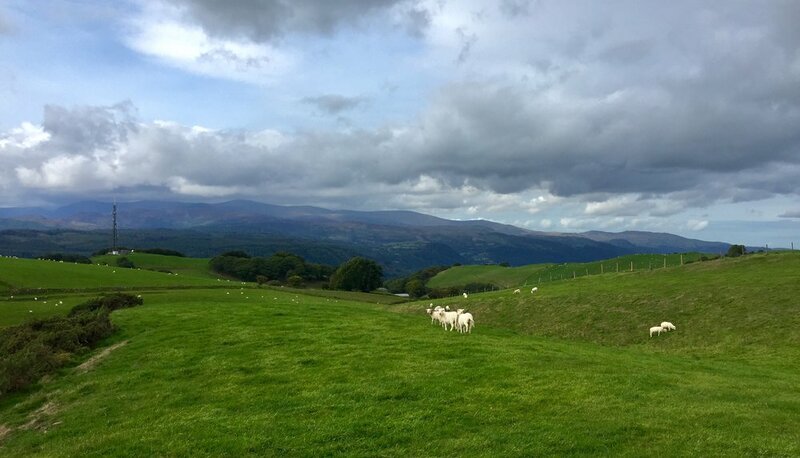 Another busy month for us, with Snowdonia welcoming visitors from all over the world to enjoy the sights and activities North Wales has to offer. We hosted guests from the UK, Germany, the Netherlands, Belgium, Hungary and Ireland amongst other places! The garden continued to bloom despite the very warm weather. The first pumpkin flowers appeared (fingers are crossed for them to arrive in time for Halloween!) and potatoes were dug up. 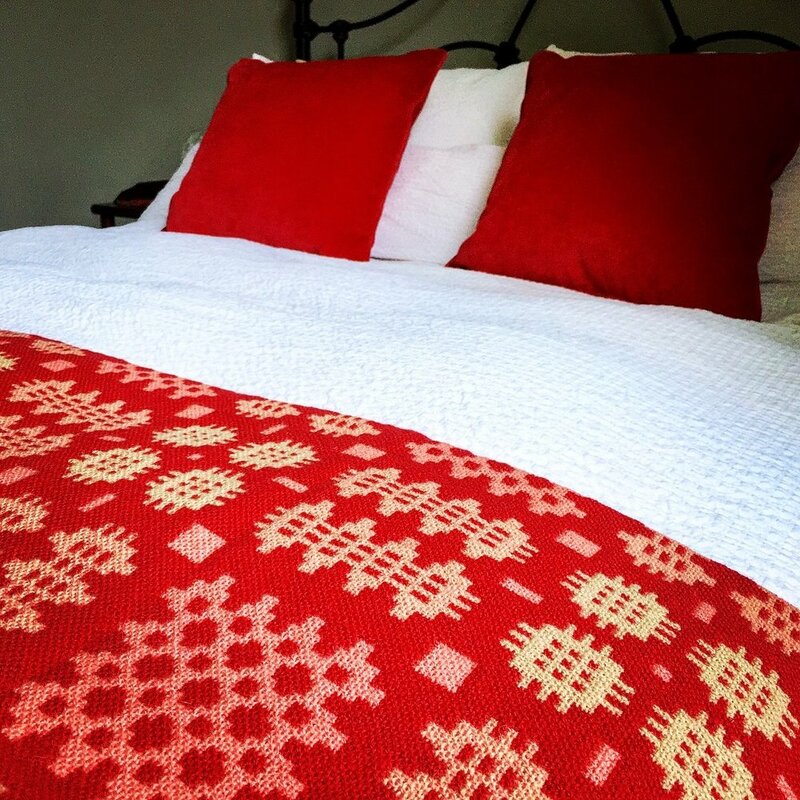 In the house new mugs from Betws-y-Coed pottery were introduced to our guest bedrooms, whilst fresh new linens and traditional Welsh throws from our very own Trefriw Woollen Mills enhanced them even further. The latter have been on our list for a long time and we're delighted with them - beautiful hand crafted pieces that really brighten up the spaces, and proudly from our village! 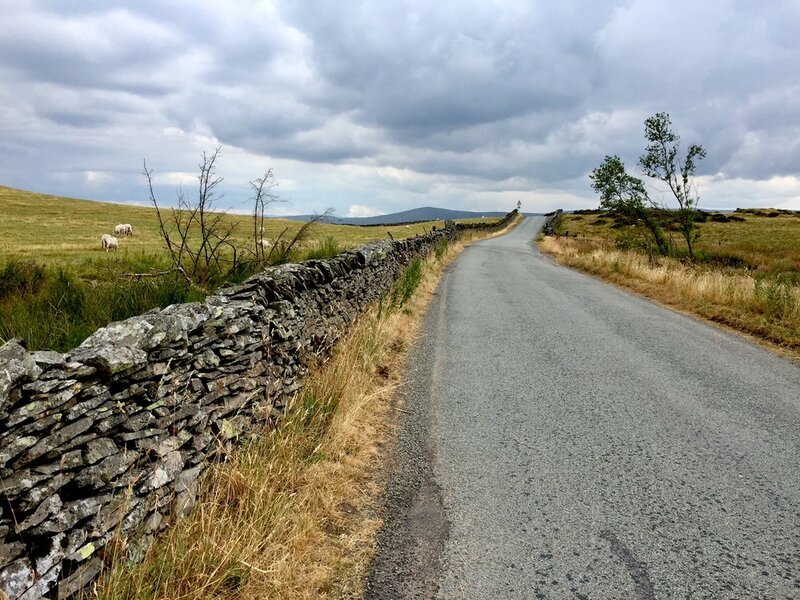 Despite being busy we still found time to enjoy our surroundings, including bike rides along the coast and onto the moorland above the Conwy Valley. Largely traffic free routes = great cycling! And the World Cup meant it was time for our traditional celebration of it - "World Cup Dinners"! Whilst we don't offer evening meals to guests (the pub and brasserie next door are too good!) we do enjoy cooking, and the challenge as usual was to create meals from a country playing that day. This meant we enjoyed such diverse offerings as Spanish salad, Japanese sushi, Swedish meatballs and beetroot salad, French onion, anchovy and olive bread and Croatian kale pie! Summer truly arrived in Trefriw with another month of warm sunny days which our surfing, walking and climbing guests thoroughly enjoyed. The garden reached its fullest and our vegetables, herbs and salad really shot up. Meanwhile at Bodnant Garden the laburnum arch was at its glorious golden best. Inside we got creative and, inspired by our friends at POP in Porthmadog, made a new light fitting for our snug out of old wine bottles. After a few trial runs involving YouTube video tutorials, string and nail polish remover, we were pretty pleased with the result! We enjoyed lovely bike rides up hills and down dales, fuelled by cake from Tea on the Green at Bolton Abbey, and local ales. On our final day we visited Salts Mill in Saltaire near Bradford - a former mill now housing contemporary art exhibitions, antiques, and beautiful home decor items. Back at home we cheered on the OVO Energy Women's Tour as they whizzed through Trefriw on their bikes. We helped decorate the village with white and green balloons and like to think our enthusiastic saucepan banging gave the riders a boost!! Another hectic month with us welcoming guests from both around the UK and Germany, The Netherlands, Belgium, and the USA! Its always fascinating to find out why people are visiting our beautiful area and our May guests included zip-wirers, Snowdon walkers, birthday celebrants, house hunters, intrepid adventure racers and two people who had no idea they were coming here having booked a surprise trip to 'somewhere' with unplanned.de ! Despite being busy we still found time to again enjoy our wonderful surroundings, and we started the month by walking up Snowdon. An early start (7am) at Pen-y-Pass meant we had the Pyg Track pretty much to ourselves going up, and we were first in the cafe at the top as it opened it's doors at 10am! The views at the top were stunning, and we returned via the Miners' Track to the bottom. 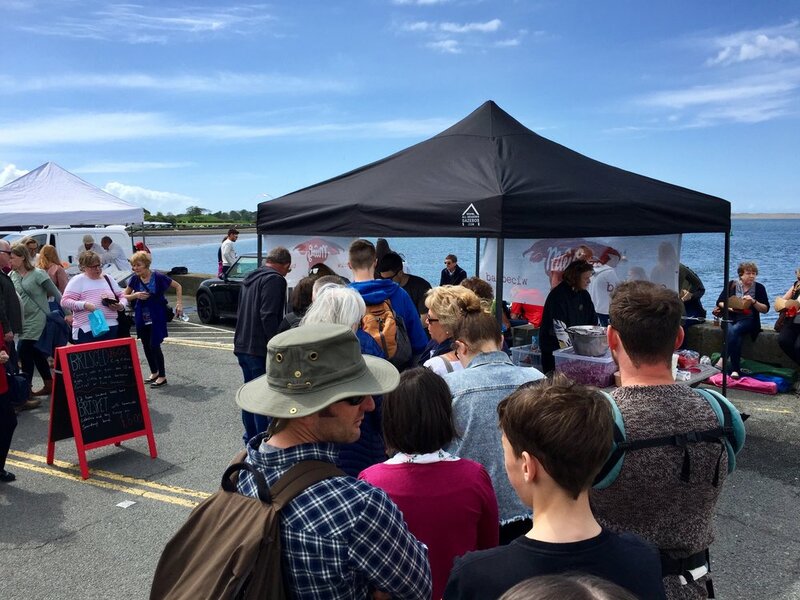 Mid-May saw Caernarfon hosting their popular food festival and we had a great afternoon wandering amongst the food and drink stalls with their delicious and tasty offerings. We had to try the slow-cooked brisket served in the fantastic sourdough bread from our very own Trefriw Bakehouse. The fine weather in May meant our garden continued to flourish. It is a lovely place to relax in. Little pockets of colour have popped up everywhere, creating quite a spectacle! Harry and Meghan's big day was celebrated with some home-made banana muffins for our breakfast buffet, complete with edible efigies of the happy couple. They also made an appearance at the Trefriw Walking Festival amongst the array of fabulous locally baked goodies at the cake afternoon. We ended the month how we started it - with another hike up Snowdon! Friends visiting us wanted to walk up our nearby 'hill' so we decided to join them. This time we headed up the Llanberis Path which was not as easy as some suggest, and then headed down the Miners' Track again. It was much hotter on the day than our previous effort earlier in the month but we all made it up and down in one piece. No more Snowdon for us though, for a few months at least......! The month also brought milder temperatures and the first warm spring sunshine of the year, so we spent many afternoons in the garden. We've dug out three vegetable patches and planted courgettes and potatoes, with beans, pumpkins and tomatoes to follow. The flower beds are now full of seeds which should grow into a colourful display for people and bees alike to enjoy. We also cleared the path from our garden to the Old Ship's next door (crucial...), refurbished the 'love seat' which collapsed when we sat on it (rotten timbers the ONLY reason! ), and installed a fire pit and solar-powered lanterns. The mid-month heat wave gave us the chance to test it out (very cosy) and we're looking forward to warm summer evenings spent outdoors so that we and our guests can enjoy the views and sounds of the beautiful countryside that surrounds us. ... and given the bedroom furniture a little facelift with the replacement of all the wooden knobs. Even though it was a busy month, we enjoyed a day trip to Caernarfon, with its winding lanes, independent shops and cafes, and magnificent castle. It was great to discover the fabulous Roberts and Astley store where we fell in love with some vintage furniture. The town is a real highlight for any visitor to the area! The "Beast from the East" and Storm Emma combined over Trefriw to delay Spring ever so slightly, with more snow dumped on us and freezing temperatures resulting in impressive icicles! The house felt cosy though and as usual the village looked pretty with a layer of snow on it. The cold snap soon ended though and we had some beautiful crisp days when we enjoyed walks, including one from Llandudno Junction to West Shore beach and back. Lunch in the West Shore Beach Cafe was the half way treat - always enjoyable! - and then a cheeky (perfect) coffee at our favourite hot beverage emporium, Providero, in Llandudno Junction, provided a welcome boost at the end of our eight mile walk. The biggest news of the month was the announcement that our neighbour and local pub - The Old Ship - introduced their new 'Gin Menu'. Another sunny day in the middle of March allowed us to go out and explore our beautiful surroundings. We headed south to Harlech Castle first, paused for lunch in Porthmadog (discovering the excellent Big Rock Cafe), then drove back via Beddgelert, stopping regularly to marvel at the stunning views. A fantastic day! Towards the end of March we started to get busy with bookings and it was time to welcome guests to our home. Some were returning visitors having stayed with us last year which was lovely! This all meant it was time to get to work in the kitchen. I started things off making a rather large jar of orange marmalade which is proving to be very popular. For a first time effort it went very well! Jasmine then had an epic baking session making easter bunny gingerbread biscuits and hot cross buns. By the time Easter weekend came we were ready to welcome our guests and it was great having the house full. It was also satisfying to see everybody having a thoroughly good time, enjoying surfing, zip-wiring and walks from the door amongst other things. A fantastic New Year came and went, with the house full of friends who celebrated with us the end of a momentous year. As soon as they departed though it was onwards with the "programme of works" (c) to get the house ready for our 2018 guests! Door panels were introduced to all of the previously flat internal doors. Hours of measuring, sawing and painting were worth it though with them all looking more at place in a Victorian property. Very satisfying! With the doors done next on the list was our middle-floor guest lounge - the last room waiting to receive a makeover. The old sofa and chairs (Ikea originals we think from the 1980s!) were removed and we were left with a blank canvas. Dark grey walls replaced the previous pale green colour and the period features got a fresh coat of white paint. 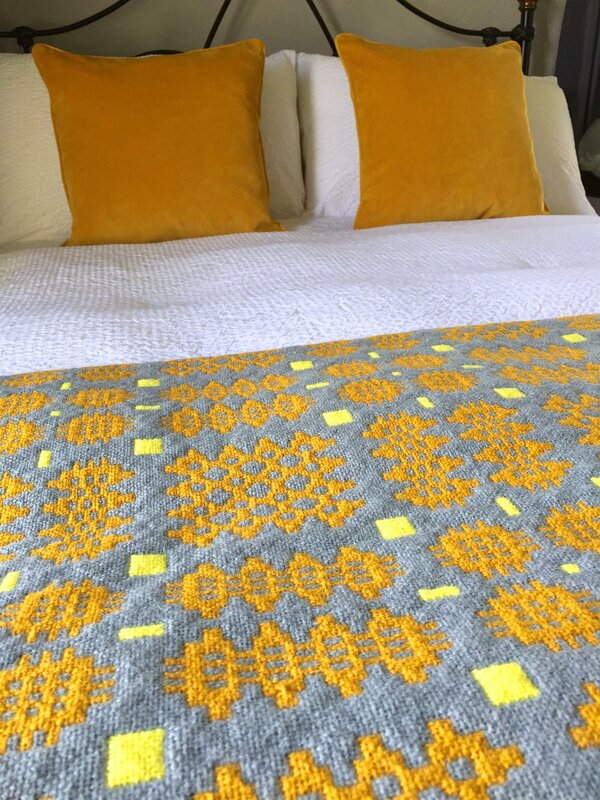 Striking yellow armchairs were introduced for a shock of colour and we sourced some lovely pieces of furniture from Pica Pica Home. We had good fun choosing the pictures and items for the wall, all of which have a story behind them. The end result is stunning and it's a lovely room to relax in. We ended up using it ourselves for a few weeks whilst our own lounge had building work done to it! Thankfully it wasn't all decorating in January! The weather was kind to us on many occasions so we enjoyed walks and bike rides in the local area, including a stunning ride up the hill to Llyn Crafnant - the views are amazing.